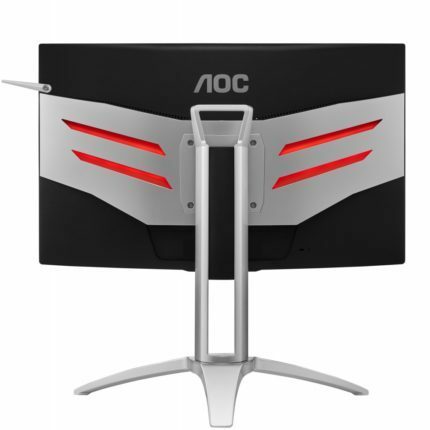 In addition to the AOC AGON AG322QCX gaming monitor, AOC will also release a smaller version of it, the AOC AGON AG272FCX. Both monitors will be available in May 2017. The only difference between the two lies in the screen size and the resolution. The AOC AG272FCX PC monitor features Full HD resolution, a 27-inch screen, 144Hz refresh rate, FreeSync, and extensive ergonomic options as well as numerous exclusive gaming features. 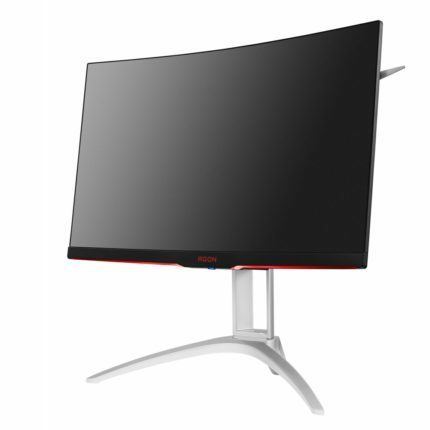 As it’s the case with most of the curved gaming monitors, the AOC AGON AG272FCX will feature a VA panel which ensures the flawless 178-degree viewing angles, a superior contrast ratio for incredibly deep black tones, and an overall vibrant image quality with accurate colors which cover 100% of the sRGB gamut. Moreover, the panel allows for the maximum response time speed of 4ms response time which is viable for the fast-paced video games with a barely noticeable blur of the fast moving objects. The curvature is only 1800mm, although it’s still enough for an improved immersive gameplay experience. Not only will the gaming experience be immersive with a stunning image quality, it will offer a buttery smooth performance due to the 144Hz refresh rate and FreeSync. The latter can significantly enhance the performance in video games, but only if you have a FreeSync compatible AMD graphics card. If you do or plan to get one, you can gain a synchronized frame rate between the AOC AGON AG272FCX VA monitor and your GPU which will, as a result, eliminate screen tearing, stuttering, and input lag. You will still be able to use the monitor if you have a Nvidia graphics card, but you won’t be able to gain the dynamic refresh rate. The AOC AGON AG272FCX will have all the exclusive features from the AGON series which includes the AOC Shadow Control, Low Input Lag Mode, and customizable gaming modes. The shadow control feature offers increased visibility in the dark scenes of the video games by brightening up the screen when it’s needed while the low input lag mode further decreases the input lag for the most responsive gameplay. Depending on the genre of the game that you’re playing, you can use the already calibrated picture settings for difference scenarios such as Racing, FTS, and RTS, or you can make your own. Instead of reaching for the OSD buttons every time you wish to adjust the settings or swap between a picture presets, you will be able to simply use the QuickSwitch keypad which is a controller that comes along with the monitor. It allows you to effortlessly run through the OSD settings and its features. The AOC AGON AG272FCX FreeSync monitor is flicker-free and offers the AOC Low Blue Light Filter which eliminates the harmful blue lights and allows you to play for hours to an end without straining your eyes. The design of the AOC AGON AG272FCX PC display isn’t much different from any AGON series monitor which is a good thing. There’s the trademark headset holder and a carrying handle available as well as plenty of ergonomic functionalities including 30 degrees of swivel to the left and right, -5.5, 28 degrees for tilting, and up to 110mm for height adjust. The monitor is also VESA mount compatible with 100 x 100mm pattern. The bottom bezel and the stripes at back have LED lights which you can customize in red, green, and blue colors and with three different levels of brightness. In addition to the “three-side frame-less” type of the design, there certainly are no drawbacks when it comes to the appearance of this beautiful gaming beast. The connector ports are as follows: two HDMI, one DisplayPort, one VGA, two USB 3.0, one of which has fast charging capacity, an audio line-out, and a microphone line out/in port. There’s also an audio line-in port for the 2x3W built-in speakers. The AOC AGON AG272FCX 1080p monitor will be available in May 2017 for $500. The price may sound too high for a Full HD resolution monitor, but if you consider the 144Hz refresh rate, the adaptive-sync, the flawless design and ergonomics, and the high-contrast VA panel along with the plethora of unique gaming features, it’s a pretty good deal. The price tag would be more appealing if the monitor had the 1440p resolution, but then consumers would need a more expensive computer gear as well. For those with a bigger budget and better computer rig, there’s the AOG AGON AG322QCX, the 31.5-inch 1440p version of this monitor. Overall, the AOC AGON AG272FCX offers everything an average player needs for an immersive gaming experience. While the high-contrast and color-accurate VA panel ensures a fascinating image quality, the high refresh rate and the adaptive-sync provide a fluid performance. Due to the subtle curvature and the thin-bezel design, the monitor is quite attractive and can be a nice investment for everyday use and casual high-quality gaming on the side as well. Professional gamers will still prefer a TN panel monitor due to the fastest response time possible, but that doesn’t mean that they would actually enjoy more while playing on one of these. The AOC AGON AG272FCX will auspiciously offer a vibrant image quality due to the VA panel with high contrast and color gamut while the high refresh rate and the adaptive-sync ensure smooth gameplay experience. In addition, the monitor offers a simply beauteous design with plenty of ergonomic and connectivity options. 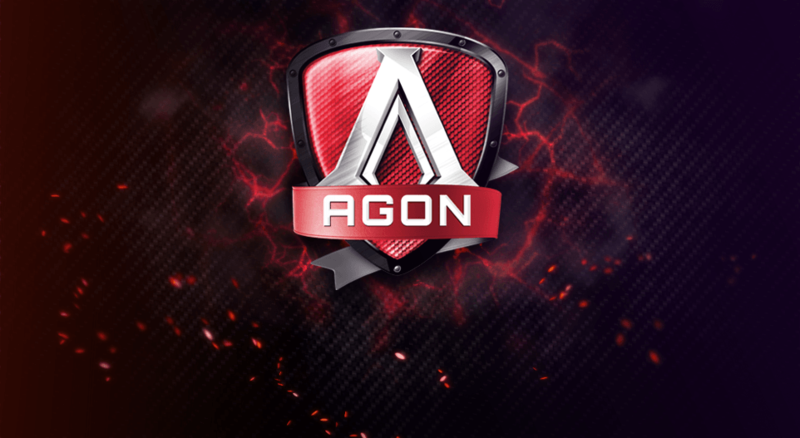 All the exclusive AGON series gaming features are also present with this model.